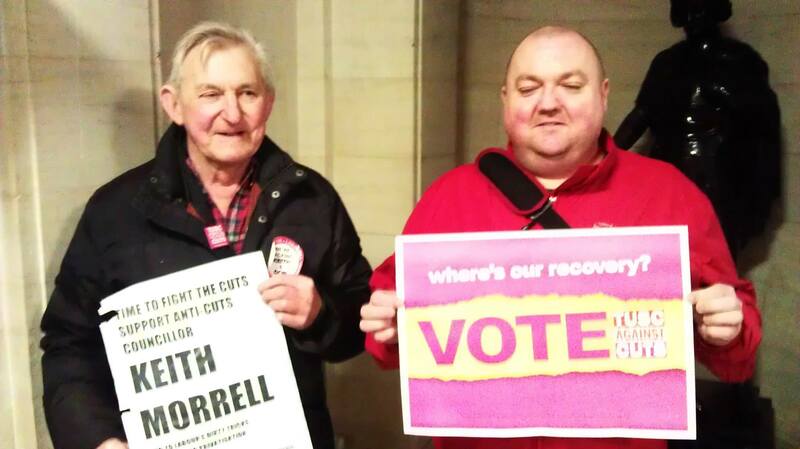 The Labour Councillors running the city are, to their shame, planning to axe vital adult social care services. They are claiming that, in their own weasel words, they are simply “re-providing and re-designing the provision of adult care services”. Don and Keith deplore this attack on the most vulnerable people in our communities. 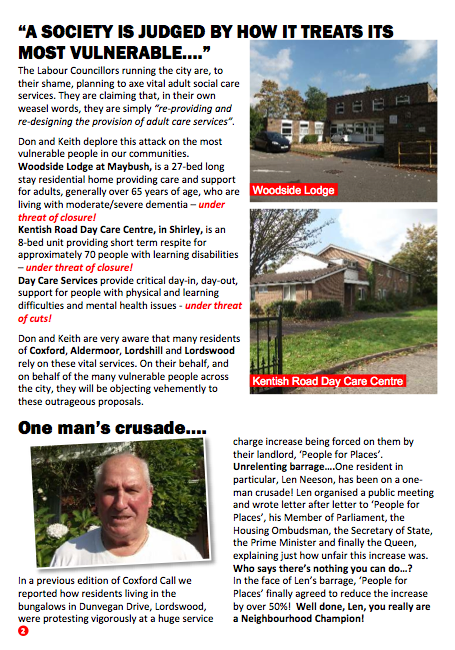 Woodside Lodge at Maybush, is a 27-bed long stay residential home providing care and support for adults, generally over 65 years of age, who are living with moderate/severe dementia – under threat of closure! Kentish Road Day Care Centre, in Shirley, is an 8-bed unit providing short term respite for approximately 70 people with learning disabilities – under threat of closure! Day Care Services provide critical day-in, day-out, support for people with physical and learning difficulties and mental health issues – under threat of cuts! 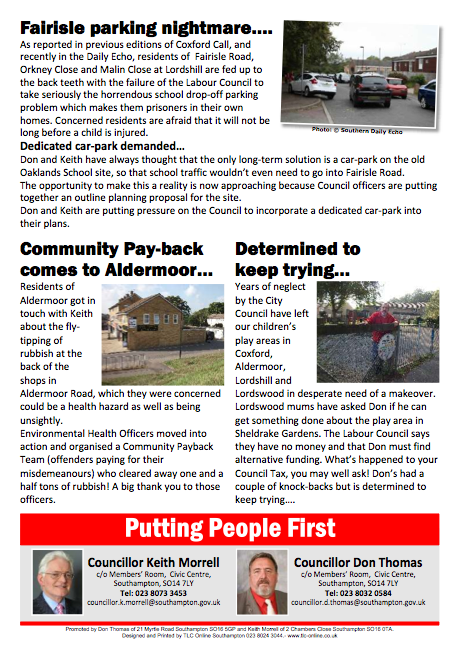 Don and Keith are very aware that many residents of Coxford, Aldermoor, Lordshill and Lordswood rely on these vital services. On their behalf, and on behalf of the many vulnerable people across the city, they will be objecting vehemently to these outrageous proposals. charge increase being forced on them by their landlord, ‘People for Places’. Unrelenting barrage….One resident in particular, Len Neeson, has been on a one- man crusade! 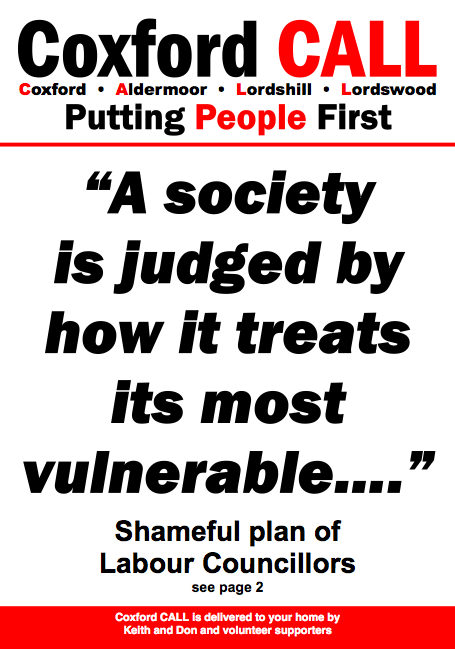 Len organised a public meeting and wrote letter after letter to ‘People for Places’, his Member of Parliament, the Housing Ombudsman, the Secretary of State, the Prime Minister and finally the Queen, explaining just how unfair this increase was. Who says there’s nothing you can do…? In the face of Len’s barrage, ‘People for Places’ finally agreed to reduce the increase by over 50%! Well done, Len, you really are a Neighbourhood Champion! Attack on our local firefighters…. Firefighters risk life and limb protecting us. Residents of Coxford, Aldermoor, Lordshill and Lordswood have good reason to thank the crews from our local fire-station at Redbridge. As part of their drive to slash spending on public services the government wants to make firefighters pay for the deficit caused by bailing out the bankers by making them work longer and pay even bigger contributions to their pension scheme but get a smaller pension when they retire. Firefighters will be required to work until they are 60. But a report commissioned by the government warned that two thirds of them will not meet the current fitness standard – that means they may be forced to retire at 55 due to a natural decline in fitness and lose up to half of their pension, or face the sack. Firefighters already make hefty contributions from their salaries towards their pensions, but this year their contributions were substantially increased for the third year running, and will increase yet again in 2015. 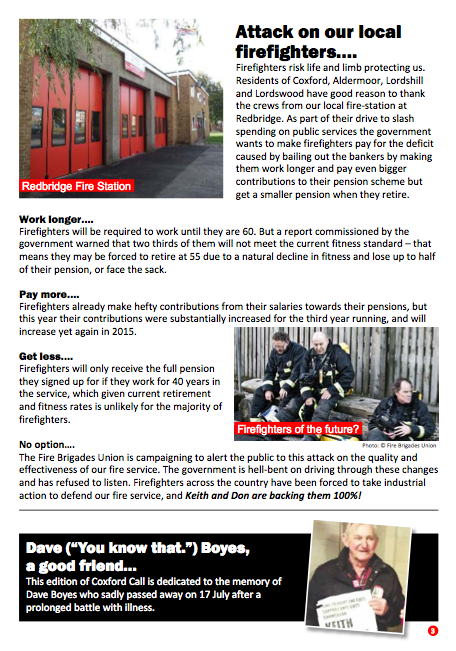 Firefighters will only receive the full pension they signed up for if they work for 40 years in the service, which given current retirement and fitness rates is unlikely for the majority of firefighters. The Fire Brigades Union is campaigning to alert the public to this attack on the quality and effectiveness of our fire service. The government is hell-bent on driving through these changes and has refused to listen. Firefighters across the country have been forced to take industrial action to defend our fire service, and Keith and Don are backing them 100%! As reported in previous editions of Coxford Call, and recently in the Daily Echo, residents of Fairisle Road, Orkney Close and Malin Close at Lordshill are fed up to the back teeth with the failure of the Labour Council to take seriously the horrendous school drop-off parking problem which makes them prisoners in their own homes. Concerned residents are afraid that it will not be long before a child is injured. Don and Keith have always thought that the only long-term solution is a car-park on the old Oaklands School site, so that school traffic wouldn’t even need to go into Fairisle Road. The opportunity to make this a reality is now approaching because Council officers are putting together an outline planning proposal for the site. Don and Keith are putting pressure on the Council to incorporate a dedicated car-park into their plans. Residents of Aldermoor got in touch with Keith about the fly-tipping of rubbish at the back of the shops in Aldermoor Road, which they were concerned could be a health hazard as well as being unsightly. Environmental Health Officers moved into action and organised a Community Payback Team (offenders paying for their misdemeanours) who cleared away one and a half tons of rubbish! A big thank you to those officers. Years of neglect by the City Council have left our children’s play areas in Coxford, Aldermoor, Lordshill and Lordswood in desperate need of a makeover. Lordswood mums have asked Don if he can get something done about the play area in Sheldrake Gardens. The Labour Council says they have no money and that Don must find alternative funding. What’s happened to your Council Tax, you may well ask! Don’s had a couple of knock-backs but is determined to keep trying…. This edition of Coxford Call is dedicated to the memory of Dave Boyes who sadly passed away on 17 July after a prolonged battle with illness. This entry was posted in Uncategorized and tagged City Council, Coxford, Don Thomas, Fairisle Road, FBU, Fly-tipping, Kentish Road, Labour Council, Parking, People for Places, Redbridge Fire Station, Sheldrake Gardens, Woodside Lodge. Bookmark the permalink.